Confession: I don’t love rosewater. Or orange flower water. To me they’re like cilantro – I’m just happier without them. And yet, because of this project, flower waters have become a fixture in my baking rotation, flavoring treats like Portugal Cakes and Artificial Potatoes. (Early modern recipes use flower waters when we might more readily use vanilla extract, for instance, which would have been cheaper and more readily available.) So, this time I decided to give myself a little vacation from floral tastes. Something easy, something that didn’t make me sigh and reach for the rosewater again. I also wanted to check out a recipe book we hadn’t explored yet. It’s easy to play favorites – I’m looking at you, Ms. Codex 1038 – but the Kislak Center’s holdings include many others. I recently spent a pleasant morning going through some of these, including UPenn Ms. Codex 830. Unlike most of the recipe books we’ve cooked from so far, it is identified as the property of one person, Eliz. Kendrick. 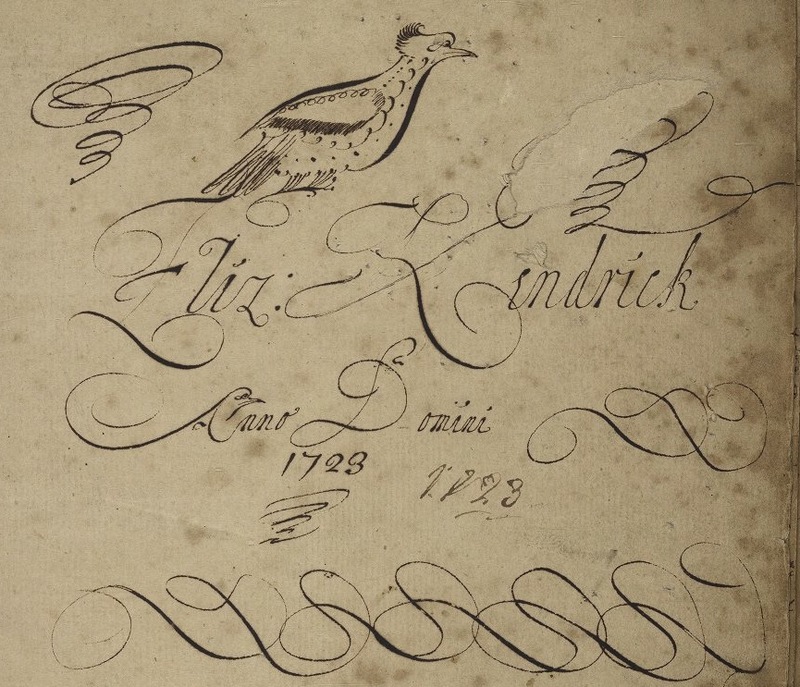 The title page displays her name, 1723, and a striking calligraphy drawing of a bird. Kendrick’s book includes a higher than usual concentration of recipes for wines: damson, balm, raisin, elderflower, sage, lemon, gooseberry, birch. I’m not feeling quite adventuresome enough – yet – to turn to winemaking, but my curiosity about the taste of sage wine might eventually win out. Kendrick also includes many recipes for baked good like “Appel flitters [i.e., fritters],” “Biskets Cousins Hobbs way,” and “A Rich Cake,” which calls for 25 eggs. (The “Exelent Cake” on the same page only calls for 20 eggs, in case you’re feeling stingy.) I added a few of these to my to-be-made file but stopped short when I flipped to a recipe “To make fry’d Cream.” Fried cream? SOLD. Arrange the bread slices in a pie dish or other heatproof vessel, even a rimmed baking sheet. Depending on the size of your vessel, they might overlap, but try not to have more than two layers. Heat all other ingredients over low-med. heat, whisking frequently, just until small bubbles form along the edges of the pan and the mixture is hot to the touch. Pour slowly over the bread slices, trying to distribute the liquid evenly. Press down gently on the bread with a fork to soak each piece; cover loosely with foil or plastic wrap and let sit 30 mins. Flip the slices and press down on them a few times while they’re soaking to make sure each piece is saturated. Heat a nonstick frying pan or griddle on med. heat. Carefully lift one slice of bread at a time and place it in the pan; once you have fit as many slices as possible, pour a few tablespoons of the soaking liquid over them. Fry for 3-4 mins. on one side, flip over, then fry for 2-3 mins. on the other side, until they’ve picked up some color, like french toast. Serve warm. Not surprisingly, fried cream turns out to be like a very rich, slightly boozy, soft french toast. The white wine and high proportion of heavy cream make this a heavy-hitting dish; I’m no lightweight when it comes to rich food, but I managed about half a slice before needing a breather. The main difference between fried cream and french toast is that fried cream has a higher cream-to-egg ratio, producing a softer, wetter result. It’s unclear when in the day Kendrick and her contemporaries might have eaten this fried cream. We think of french toast as a breakfast/brunch option, and fried cream would certainly work for a decadent brunch, alongside fruit and coffee. Minus the sugar, it would also make a simple dinner with a green salad plus vinaigrette. (Whenever you eat it, I think some acidic accompaniment to cut the richness would be helpful.) I really liked the tangy addition of white wine to the soaking mixture – something a little different from other boozy french toasts made with bourbon or liqueurs like Grand Marnier. I used sourdough in 1/4″ slices, but these were really too thin to hold together well after soaking; I think the thicker 1/2″ slice would be easier to work with. A denser white or multigrain loaf, even challah, would work well – anything you’d like for french toast. It would be easy to play with the spices here, adding other flavors to the nutmeg. Cinnamon would work, of course, and ginger in the winter might be nice. You could also infuse the cream with a vanilla bean, cinnamon sticks, or another flavor before adding the other ingredients. Some orange zest would be lovely. And while I have no qualms about heavy cream, substituting milk for maybe half of the cream might lighten things up a bit. Just a bit – the recipe IS called “fry’d Cream,” after all. Light it isn’t. Oh, it’s poor knights of Windsor! Now I personally loathe vanilla and would rather have flower water. I know – suffering through a mild distaste for flower waters doesn’t really qualify for martyrdom, does it? Afraid not. Unless too much of them makes you throw up, which vanilla can do to me…. This is a lovely looking recipe for those of us who love cream. I agree that a more dense bread would be a better sponge for the custardy sauce. I think the last line of the receipt tells you to use any remaining liquid that is left over to pour over the bread. I understand your reluctance to use rose water, but I have found that it comes in varying strengths. The stuff I get from my Indian grocers is much stronger than the stuff I buy at Colonial Williamsburg. Try using less of it and see if that helps. It does indeed – I found that because my sourdough didn’t absorb as much as a denser bread (in thicker slices, also) might, I poured a few tablespoons of the cream mixture onto each batch as I fried it. More than that made for soggy slices difficult to get out of the pan. And thanks for the suggestion to try some different rosewaters. Mine is also from an Indian grocer, but I’ll be on the lookout for another. I do use it and eat the floral-flavored baked goods – never waste a cookie! – I just find it a bit perfume-y for my taste. This recipe reminds me of pain perdu, in New Orleans. Eggs and milk (but today’s stinginess with cream is understandable) We sliced the long “Parisienne” style loaves used for Poorboy sandwiches very thickly (almost 1 inch), on the diagonal, and dry them overnight, preferable under your ceiling fan! There was one brand that would dry to almost Styrofoam consistency! Then SOAK them in the egg-rich milk, with vanilla (and booze if wanted) until you have to lift them out with a spatula. Fry them on a skillet in butter on one side. When you turn them over, they will puff up like a mini-soufflé! The inside is moist and tender like a souffle. DELICIOUS! Might be even better with cream! The women in 1723 had tons of eggs and butter and cream right out in the barn. Needed recipes to use them up! Thank you for sharing your research. I hope there is a cookbook coming one day. I collect old recipes and cookbooks, and make time-appropriate dishes for our Historical Society programs. We are in Newport, New Hampshire, founded in 1761, so those old days are still with us. It is fun to see how the early homemakers used the ingredients at hand, like caraway seed and currents, and flower waters, and all their milk, butter and eggs. Australia here and we also love and pursue the dishes of old here. Would love to hear of any interesting recipes you may have from old. Sounds like “Arme Ritter” or “poor knights” – anyway delicious! I love the caligraphy and the bird! Amazing how quickly tastes change, no? I often struggle to find exactly how to make the recipes I translate more modern! I think that last is ‘if any be left’, rather than ‘lost’. Look at the F in ‘frying’ and the E in ‘cream’. Can’t wait to try this! YUMM! Made this today and my family loved it! My daughter (19) did improve upon it though. Drizzle sweet Greek Yogurt over the finished bread and then some mixed fruit from the can (drained syrup first). An astounding melding of old and new coming together. Brilliant! This just made it into our family recipe bible. Our family’s history of the most favourite dishes, old and new. Thank you for adding another page to our history.